Completed infill repair using Concrete Cloth GCCM. A part of California Highway 1—located in Big Sur, Calif.—has been closed for 14 months to reconstruct the slope and road damage caused by the Mud Creek landslide. The highway was partially reopened in July 2018 as a one-lane road while work continues to complete the reconstruction. The work will continue in 2019 through the wet season to complete the project. John Madonna Construction (MC), from San Luis Obispo, Calif., has been using new construction techniques and products for this project. Individual GCCM strips were cut and placed to protect a gravel drainage base. A typical solution for this type of job is to simply cover the infill area with plastic, but MC wanted a more permanent repair for this project, so it chose Concrete Cloth geosynthetic cementitious composite mats (GCCM) to complete multiple projects along the highway. This product was installed to protect a gravel drainage base along the shoulder of Highway 1 from erosion and water runoff. The material also is being used to reline an existing concrete drainage ditch that was showing signs of deterioration and cracking. The third application of the product was designed to redirect storm water directly to a catch basin. Concrete Cloth CC-5 was selected based on abrasion and hydraulic conditions. Hydrating of the GCCM to harden the material. Muller Construction Supply of San Jose, Calif., trained the workers from MC on how to properly install and hydrate the material according to ASTM guidelines (ASTM D8173-18). Installation took only half a day with a four-man crew. The MC team had to temporarily close the one-lane road—which is used for both directions of traffic by a temporary traffic light—once for 10 minutes to hydrate the Concrete Cloth GCCM with a water truck. If the company used other alternatives, closures would have lasted longer and occurred several times throughout the repair. These closures would have caused additional traffic issues and safety concerns. “Concrete Cloth GCCM completed the job perfectly,” said Brian McGovern, president of Muller Construction Supply. 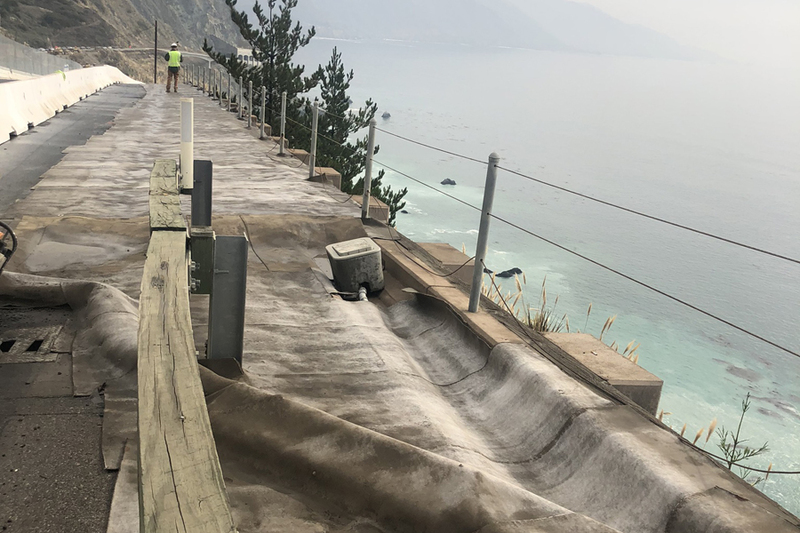 Concrete Cloth GCCM has been used on Caltrans projects for slope protection, soil stabilization, drainage channel rehabilitation and armoring for fire protection.